In the world of hard drive information utilities, HD Tune (free) is a gem. A venerable one at that--it's been around for years and no one has come up with anything better--except of course for its developers, who also sell a Pro version. HD Tune doesn't look fancy--just a tabbed dialog with a lot of cool hard drive utility features. The free version of HD Tune is adequate for most purposes and gives you a rough estimate of your drive's performance, scans your disk for errors, and retrieves the S.M.A.R.T. (Self-Monitoring, Analysis, and Reporting Technology) info from your hard drive. Said S.M.A.R.T. info (often reported by your BIOS at boot time) can tell you if your hard drive is about to give up the ghost. HD Tune is old-school in its simple tabbed dialog interface. You select the drive you want to test or query from a drop-down menu, then select either the Benchmark, Info (general drive information such as make and model), Health (S.M.A.R.T. info), and Error Scan tab. The HD Tune benchmark consists of simple read tests performed across the hard disk surface starting from the outside of the disk and moving to the inside. 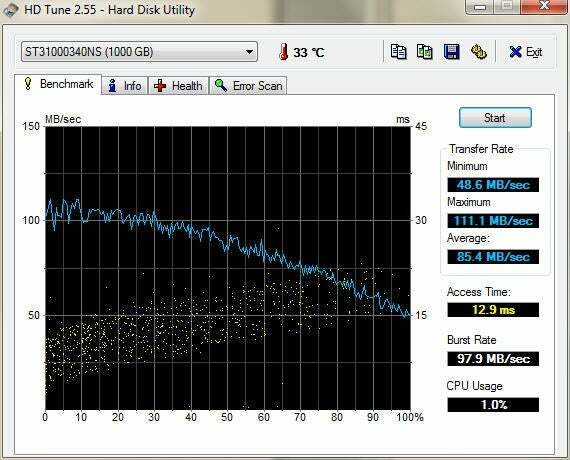 You'll notice the drop in throughput (bad) and access times (good) as the head moves towards the inside of the disk. You can run the benchmark on an SSD but you might as well stop a quarter of the way through--an SSD can access any part of its memory in the same amount of time. I've used this free utility for years, and while it won't give you a lot of specifics about hard drive performance, or give you any insight into possible operating system bottlenecks, the results are valid and always comparable to those I've garnered with more granular test suites. Said Pro version costs $35 for individuals and includes write tests, file tests, better logging, more stats, and a few other tricks. If you do any serious work testing hard drives, it's well worth it. For most users, this free utility is more than adequate.